How and Where to Buy Lamictal Online? If you want to fill your prescription for Lamictal, you can do it right here on www.CanadianPharmacyWorld.com if you have a signed copy of your prescription ready to upload. You can also speak with someone about your order, simply by dialing 1-866-485-7979. One of our pharmacy technicians would be happy to assist you. You may also visit our FAQ page to see if any of your questions might be answered there. Are there Alternative Names for the Brand and Generic Lamictal? Lamictal is the brand name medication comes from Turkey and Canada manufactured by GSK. Its generic equivalent is called Lamotrigine. 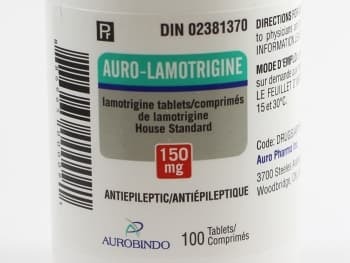 It might come from different countries including United Kingdom, Canada (Auro-Lamotrigine by Aurobindo, Mylan-Lamotrigine by Mylan), and United States. What Dosages and Forms is Lamictal available in? We carry both the brand name medication, Lamictal, and its generic equivalent, Lamotrigine, in a variety of dosages including 25mg, 50mg, 100mg, 150mg, and 200mg. What is Lamictal used for? Lamictal is an anticonvulsant medication used to treat patients with epileptic seizures. It can be prescribed as a stand-alone medicine, or in combination with others to treat seizures in both adults and children. It can also be used to delay mood episodes in adults with bipolar disorder. Most medications will come with side effects. Before deciding if Lamictal are right for you, take a closer look at what you might expect. Are there any Precautions and Drug interactions of Lamictal? You should not use Lamictal if you’re allergic to lamotrigine. Be sure to talk to your doctor if you are using the above medication, and those you start or stop while on Lamictal. Store Lamictal at room temperature away from extreme heat, light, and moisture. Lamictal may cause a severe, or life-threatening rash in children and adults who take too high of a dose at the start of treatment. It may also occur if you are taking Lamictal with Depakene or Depakote. Do not stop taking this medication suddenly. Even if you feel fine, talk with your doctor if you feel you’d like to reduce your dosage. Taking this medication during early pregnancy can increase the risk of having a baby born with a cleft lip or cleft palate. Talk with your doctor if you are pregnant or nursing to see if Lamictal is right for you. Lamictal may produce suicidal thoughts in some patients. Talk with your doctor and have your family or other caregivers alert to changes in your mood or symptoms. To make sure you’re on the right dose for you, your doctor may require frequent blood tests.